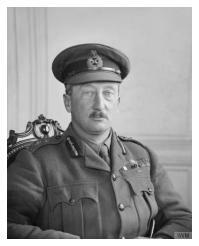 The retired General Sir Hubert Gough, who had commanded the Fifth Army during the First World War, drew the British public's attention to the contribution made by Ireland's citizens in the current British war effort with his letter to The Times of London on 26 September 1941. He wrote that 'very large numbers of Irishmen have joined H.M. Forces since the outbreak of war'. He went on to emphasise the excellent military qualities of Irish troops in the field '...particularly when they are embodied in distinctively Irish units where their esprit de corps and their long-cherished traditions of soldierly valour directly inspire them'. He then suggested '... that existing Irish units should be regrouped as an Irish brigade or division'. Churchill expected rumblings from Northern Ireland, where General Gough's previous political views were already at odds with Unionist government policies, and where the title 'Ulster Brigade' found greater favour. Northern Ireland's Prime Minister wrote to Churchill on 12 December 1941, explaining that the title 'Irish Brigade' would be associated with Irishmen who had fought for the French in the 17th and 18th century, for the Boers, for the German's Irish Brigade during the First World War, and more recently, the fascist Irish Brigade fighting for Franco in the Spanish Civil War. 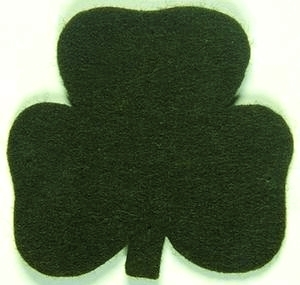 When 210 Independent Infantry Brigade came under command of 1st Infantry Division at the end of December 1941, it then brought under command three Irish battalions - the 6th Battalion The Royal Inniskilling Fusiliers, the 1st Battalion The Royal Irish Fusiliers and the 2nd Battalion The London Irish Rifles. Gough's suggestion came to fruition when 210 Brigade was retitled 38th (Irish) Infantry Brigade on 13 January 1942. Later that year the Irish Brigade deployed to French North-West Africa with 6th Armoured Division and fought to stem a German advance in Tunisia before transferring to 78th (Battleaxe) Division. It took part in the Allied advance on Tunis, including the battles for Longstop Hill. In late-July 1943 the Irish Brigade landed in Sicily where it captured the hilltop town of Centuripe, an ‘impossible’ victory according to General Montgomery. From Sicily the Allies moved to mainland Italy where the Brigade helped turn the tide of battle at Termoli in October 1943 before fighting several bloody battles on the eastern seaboard. In May 1944 it led 78th Division’s breakout from Eighth Army’s bridgehead in the final battle of Cassino. The Irish Brigade’s advance on Highway 6 prompted the Germans to evacuate Monte Cassino. Further fighting followed throughout that summer and the winter of 1944–45 before the Irish Brigade played a major role in Eighth Army’s final offensive in Italy, the breakthrough at the Argenta Gap in April 1945. With a Battalion in armoured personnel carriers, the Brigade cleared the way for final Allied victory in Italy and one of the most decisive defeats suffered by the German armies in Europe. The Irish Brigade ended the war in Austria. All three commanders of the Brigade (The O'Donovan, Nelson Russell and T P D. Scott) were 'Faughs' (Royal Irish Fusiliers).